Summary: In The Supreme Macaroni Company, Adriana Trigiani transports readers from the cobblestone streets of Greenwich Village to lush New Orleans to Italy and back again while exploring the tricky dynamics between Old World craftsmanship and New World ambition, all amid a passionate love affair that fuels one woman's determination to have it all. For over a hundred years, the Angelini Shoe Company in Greenwich Village has relied on the leather produced by Vechiarelli & Son in Tuscany. This ancient business partnership provides the twist of fate for Valentine Roncalli, the schoolteacher turned shoemaker, to fall in love with Gianluca Vechiarelli, a tanner with a complex past . . . and a secret. But after the wedding celebrations are over, Valentine wakes up to the hard reality of juggling the demands of a new business and the needs of her new family. Confronted with painful choices, Valentine remembers the wise words that inspired her in the early days of her beloved Angelini Shoe Company: "A person who can build a pair of shoes can do just about anything." Now the proud, passionate Valentine is going to fight for everything she wants and savor all she deserves—the bitter and the sweet of life itself. I've been anxiously awaiting this day for some time! 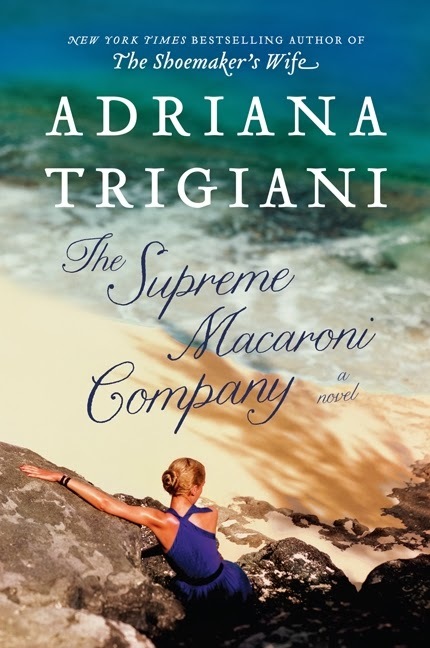 It's the official release of THE SUPREME MACARONI COMPANY by Adriana Trigiani. If you follow my blog at all, then you already know that I love Adriana both as an author and a person; and I just love seeing how her vibrant personality pops through on every page of her novels. That was certainly the case with THE SUPREME MACARONI COMPANY, the third installment in the Valentine series. I've heard that this is the final book in the series; however as a big fan of Valentine and her crazy family, I sure hope not. I think there are a lot more stories to be told -- if not Valentine's, then some other family members! THE SUPREME MACARONI COMPANY picks up where the last book left off on the roof of the Angelini Shoe Company in Greenwich Village with Valentine's business partner and love interest Gianluca proposing marriage. The marriage isn't without challenges -- Valentine is a workaholic, Gianluca is a good deal older than Valentine with an ex-wife and a grown daughter, and of course Valentine's zany family! However, Valentine is fairly confident that she can handle it all. Valentine quickly learns that it will take everything she has to balance her very full life, but she's determined to make it all work through all of the ups and downs of her passion-filled life! Of course, I loved THE SUPREME MACARONI COMPANY! I adore the characters in this series and almost feel as if I could be part of their family. (In fact, if I'm being totally honest, Valentine's crazy aunt reminds me a bit of my Italian grandmother!) I love all of their quirks and crazy antics, and I found myself smiling (and even laughing) at them on many occasions. However, despite finding a great deal of humor in Valentine's family, I admit that this book touched my heart... quite deeply. I hesitate to give too much away about this novel because it's best to experience it yourself. Suffice it to say, the Ms. Trigiani has a few surprises up her sleeve for her characters. Having said that, the "surprise" at the end didn't really seem like a shocker because there was a great deal of deliberate foreshadowing. As a reader, I knew what was coming, but I was extremely curious to see how the characters, and especially Valentine, dealt with it. So what made this book so special to me besides that it was an Adriana Trigiani novel? If you've ever read one of her novels, then you already know that she's a master storyteller. She creates not only memorable characters, but she also brings her scenes to life like few authors. And in the case of THE SUPREME MACARONI COMPANY, she describes the art of shoemaking so well that you can picture ever single design right down to the individual cuts and stitches! Of course, all of these things made THE SUPREME MACARONI COMPANY a wonderful story, but it was actually the messages that I took away from this story that brought it to the next level for me. Valentine is a very human character with her fair share of flaws -- just like the rest of us. However in this book, she grew and learned so much about herself. She realized that "having it all" isn't one bit easy and that being a good wife and mother is tough -- but so worth it! She also learned that there are many tough choices in life and that life can throw you some major curve balls. As a result of all of this, she realized what's truly important in her life. I'm going to sound a little mushy here, but these messages really hit home for me. I really don't have much in common with Valentine, but somehow, the things she faced in this book and what she learned about herself made me think about my own life... and I mean really think. I know Adriana would love that her novel is having that effect on at least one reader, but I am fairly certain that many women who read this book will feel the same way! THE SUPREME MACARONI COMPANY would make for a great book club discussion, although I think it would be best if your members had read the entire series first. There is a reading guide available with fifteen questions. Some of the themes you might want to explore include marriage, the balance of work and family, loss, secrets, family dynamics, ambition, and love. I sincerely hope this isn't the last time I will read about Valentine, but if it is, THE SUPREME MACARONI COMPANY is a fitting farewell. Highly recommended. I can't wait to read this and find out how things end up for Valentine!! I love everything Adriana's written and I already have "The Supreme Macaroni Company" loaded on my iPad and ready to go! I can't wait to get to this! I'm thinking I might try the audio. I read the first book in this trilogy and I'm currently listening to the audio of the second book which has me cracking up it's so funny. I also have this book and I can't wait to read it!